The work “Mechanical Insects” stages a future world without insects. It visualises the idea that insects, which are absolutely essential for life on planet earth, have disappeared and need to be replaced by highly complex robot insects. 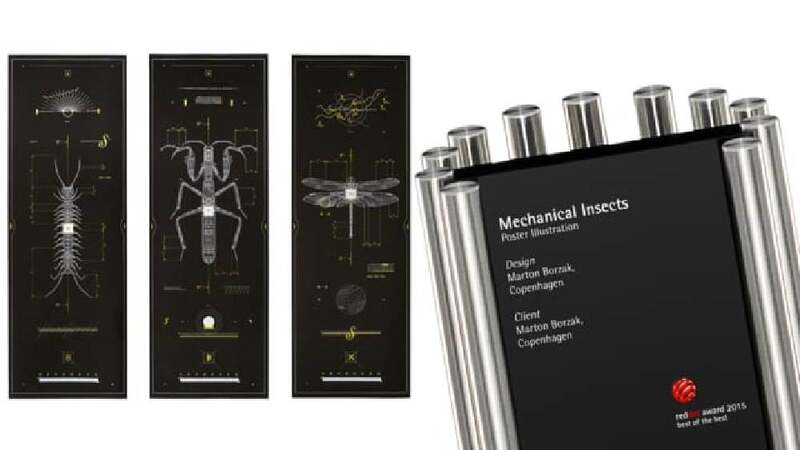 Meticulous illustrations show the blueprints and allow insights into the mechanical functionality of these future insects. It was particularly challenging to print the very thin lines that were required for the fine-layered images, especially those lines in the technical drawings. The solution was to explore the limits of silkscreen printing while printing the fine lines with white and yellow on black stock. The illustrations of the insects are complemented by information nuggets, providing information about each insect and its behaviour as well as personal thoughts and associations of the author. This poster series fascinates beholders through a world in which highly developed robots replace the insects on earth. Perfectly crafted illustrations are complemented by clearly structured, comprehensible and relevant information. Particularly impressive are the extremely fine-layered images and the technical solutions that made it possible to realise the various layers in print.